The Washington Post has managed to get hold of the flight records of Elon Musk's private jet. They have used this data to create an impressive animated map showing how the Tesla chief jetted around the world in 2018. 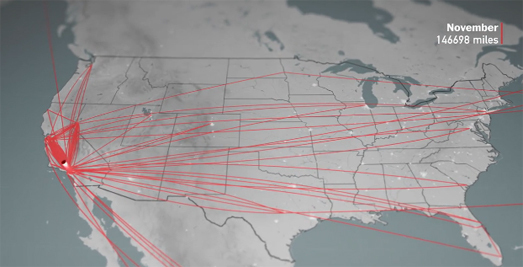 The Post's animated map is accompanied by a breakdown of Tesla's recent poor fortunes. In What 150,000 miles in a private jet reveal about his ‘excruciating’ year the Post makes a number of connections between the fate of Tesla and the many plane flights of Elon Musk. For example it points out that the flight records shows that Musk flew to Northern Ireland to visit a film set for Game of Thrones just three weeks after Tesla laid off 3,500 employees, or 9 percent of its workforce. The Post also points to Musk's championing of alternative energy sources. It says that in September Musk called fossil fuels "the dumbest experiment in human history." Days later he took a private plane journey from L.A. to Oakland just to be a spectator at a video-gaming event.